To end miniatures week we have a really tiny miniature. The leaves are 8mm long and the tiny roots spread no further than 10mm from the plant. The flowers however are gigantic in comparison at nearly 4cm across. 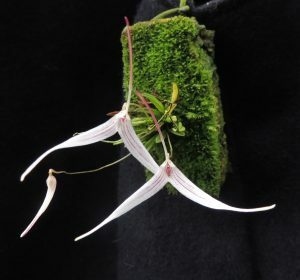 The species is native to cloud forests in southern Ecuador at around 1800m altitude where it grows in moss and shade on trunks and lower branches. 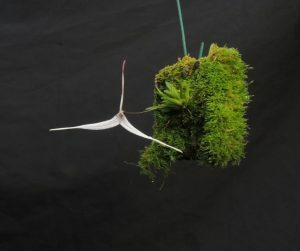 We grow the species mounted and do not add moss when mounting as we find that moss can out compete the tiny plant but, as you can see, moss grows naturally under the conditions we give plants. We then grow plants in deep shade and water daily. We find that plants benefit from splitting before they get too large and start to go down hill when leaves start to die off and drop. Another plant is shown below and the species tends to flower in the summer and again in the winter each year.